Previously I discussed how to stop procrastination and I want to dive deeper and talk about the number one key to beat procrastination. One of the biggest suggestions to beat procrastination is to just resist it; do your work anyways. It’s a great strategy if you need to do something once, or even twice. But it is a terrible strategy if you need to do something every day for four long years. Resistance is a terrible mode of coping with procrastination in the long-term. Instead, the key to beat procrastination is accepting it for what it is. 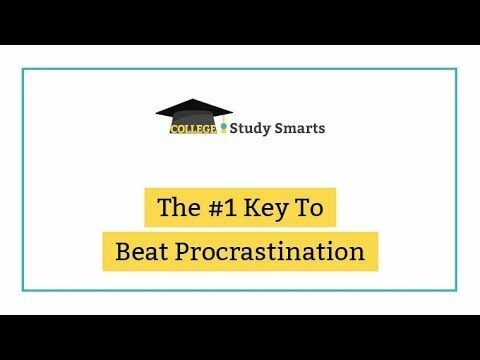 I will help you identify what your procrastination is really about and how you can accept it and stay focused on what matters most: earning your college degree. One common strategy for fighting procrastination is to resist it. To simply make yourself do the thing you are avoiding. I don’t know about you, but the longer I push against something the less energy I have. It isn’t a sustainable strategy, and we will never beat procrastination this way. Particularly if we are procrastinating studying, resisting the urge to procrastination will never work for four years. At some point, you run out of energy and will have to take a big break to recover. Imagine you are on your way to a beach race and there is a car in your way. There shouldn’t be a car there. You decide to push it out of your way. You push with all your strength and it budges a little. So you keep pushing and pushing and pushing and there is a little movement. You get to the race and perform poorly because you are exhausted. If your goal was to win the race, the car in the way didn’t matter. But it is easy to get distracted by things in our way and spend our precious energy working against them instead of focusing on what is truly important. Whatever it is you are procrastinating on right now…it isn’t the real problem. It’s a distraction; a car in your way. Resisting the car (insert whatever your procrastination thing is) is never the right solution for lasting change. The real problem with procrastination is the urge to procrastinate. If you didn’t have the urge, there would be nothing to resist. “]Let me put it in a different way. I am not a smoker; my desire to smoke is 0%. There is no urge within my body or mind pushing me to light up a cigarette. If I am stuck in a meeting and the table in front of me is stacked with all variety of free cigarettes, it has no impact on me. I don’t need to resist those cigarettes. They are benign. But my experience isn’t true for everyone. Some of you are smokers and you have this urge for cigarettes. The experience of having a table stacked with free cigarettes would be very different for you than it is for me. The act of smoking is really an act of urge and desire. People who quit smoking don’t do it by avoiding cigarettes completely for the rest of their lives. They do it by understanding the desire and crafting a plan to deals with desire differently. 1. Ask Yourself: What are you getting out of this activity? Watching TV because it makes me feel calm and relaxed. Organizing my closet because it makes me feel in control. Playing a video game because it makes me feel capable and good at something. Do you see how this works? It is an unconscious thing, but we choose to engage in one activity over another because of how it makes us feel. What am I doing instead of studying? Go do that thing for 10 minutes. How do I feel when doing it? p.s. no judgment here. This is the human experience, meaning we ALL do this and it is normal. Our brains are hard-wired to feel good. 2. Ask Yourself: Why are you really procrastinating your Homework? It is hard for me and that makes me feel stupid. I am afraid of failing the exam. I failed the last exam and am embarrassed by my performance. Ok. Let’s tie these two steps together. We avoid homework because we feel bad about it and instead engage in an activity which makes us feel good. Can you see how resisting this process will never work long-term? We WANT to feel good, and we should. I’m suggesting we understand what is going on and accept it. Really accept it. Tell yourself it is normal and it is OK. Figure out how to move forward with better energy. When we start our homework feeling good (determined, confident, hopeful, etc) the urge to procrastinate will diminish. We will finally beat procrastination and start feeling pride about our college work. A great way to boost your energy, take a moment to celebrate your successes. Do you want to get serious about beating procrastination? Check out my eBook, Pulverize Procrastination. Learn why you are getting results you DON'T want and how to get the results you DO want. Create a rockin' study plan you can stick with. Tap into your motivation and stop procrastinating homework. What could you accomplish if procrastination wasn’t getting in your way? Take 10 minutes and decide: What are you getting out of your procrastination activity? Take 10 minutes and decide: Why are you really procrastinating your homework? Choose a different way to approach homework. Check out How to Stop Procrastination for more tips on this.